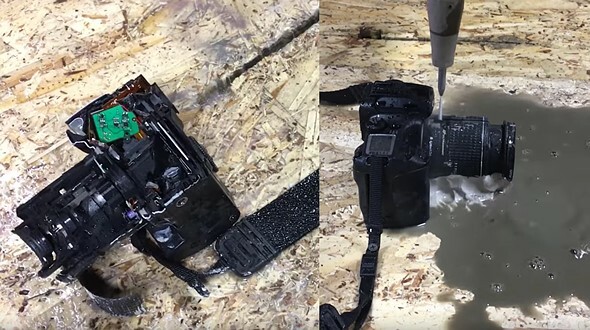 You may remember (and were traumatized by) a video that we posted earlier this year where a hydraulic press was used to crush a Nikon and a Canon camera to determine just which camera company reigned supreme. This time around a 60,000 PSI waterjet gets the honor of slicing an EOS ELAN 7E 35mm SLR in half. Camera companies often slice camera bodies in half to show off the inner workings of their new products at trade shows, but the Waterjet Channel kicks it up a notch by slicing a Canon camera body with the lens attached in half. Don’t try this at home!